Drs. 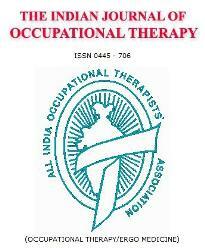 Joe Wells and Jeffrey Crabtree’s article titled “Trends affecting entry level occupational therapy education in the United States of America and their probable global impact” was published in the Sept.-Dec. (2012) issue of the Indian Journal of Occupational Therapy, a peer-reviewed journal published by the All India Occupational Therapists’ Association. Dr. Joe Wells, OTD, OTR/L, DPMIR, is CEO/ Co-owner of the SAI Group of Companies. Dr. Jeffrey Crabtree, OTD, MS, OTR, FAOTA, is associate professor of Occupational Therapy and Director of Community Mobility and Participation in Society (COMPASS) Lab at the Indiana University- Purdue University of Indianapolis and an affiliate research scientist at the Rehabilitation Research Design & Disability (R2D2) Center, University of Wisconsin-Milwaukee.